Combine the chocolate and microwave in a 2 qt. microwave bowl on P6 for 3 minutes, stirring the chocolate after each minute. Keep warm. Microwave heavy cream, orange zest, salt, honey, and Grand Marnier covered on P10 for 2 minutes. Remove and allow zest to steep for 10 minutes. Strain the warm mixture into the chocolate and whisk together, and mix thoroughly. 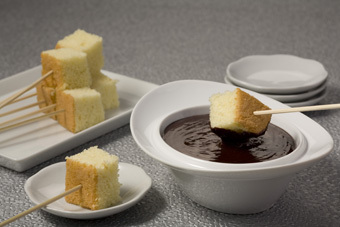 Serve warm in a fondue pot with a variety of bite-sized pieces of foods to dip. (Strawberries with stems, pitted cherries, apricots, pineapples, orange segments, sponge cake pieces, ladyfingers, etc. ).